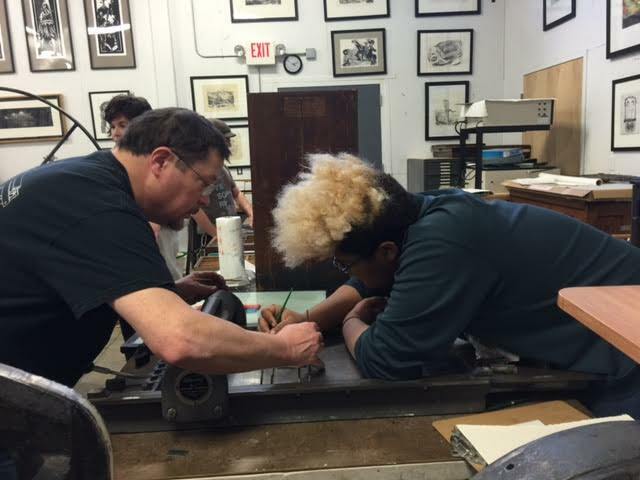 CAL's emerging artist mentorship program is designed to increase accessibility to meaningful engagement with the arts for underserved populations, specifically young artists, ages 13-18, in the Columbia area community. Selected student artists will be paired with a working professional artist in their desired media category: Photography, Ceramics/Sculpture, Drawing/Painting, Printmaking, or Digital Media. With the guidance and support of their mentor, each student is expected to develop a small portfolio of work which reflects their exploration of a concept or theme. Admission to this program is based on a demonstrated passion for fine art production and a deep commitment to growing, learning, and furthering their goals as an artist. CAL aims to pair students with top quality professional artists in our community who are actively producing work and make a living in the arts. We believe a well-designed mentorship program can have a deep and lasting impact on students’ lives. The thoughtful pairing of an interested student with a caring adult who is passionate about their field can be beneficial for the student as well as the mentor. Working one on one with a caring professional artist, protégés gain self-confidence, commitment to task, and a feeling of creative accomplishment. For the mentors, helping to nurture young talent can be highly rewarding and strengthen their own commitment to and engagement with community. Meet our Mentors for 2019! Peg Craig is a professional ceramics artist who has been producing everyday ceramic wares and fine art sculpture since 2003. She runs her own studio, Squarepeg Studios, out of her home, where she offers classes and workshops to student artists, and works along side them to create her own work for exhibition and sale. Anastasia (Stacie) Pottinger is a professional portrait photographer who has earned international attention for her forthcoming photography book, 100; What Time Creates, that features black and white abstract images of the bodies of people aged 100 and older. She spends most of her time in Columbia running her photography business, Rogue Studios, but travels annually to work with clients in Los Angeles, San Diego, Houston and Chicago as well. Her studio is in Orr Street Studios, where she has been an active member of the North Village Arts District since its inception. Michelle Marcum is a professional graphic designer working for Miller’s Professional Imaging and as a freelance designer and artist. Michelle has taught and mentored young artists for several years and is passionate about helping them make their creative vision come to life. Sarah Nguyen is a painter living and working in rural Missouri. Her work has appeared in solo and group exhibits and publications nationally and internationally. She received her BFA in Illustration from Rhode Island School of Design and her MFA in Painting from the University of the Arts in Philadelphia. She works as an Art Instructor at the University of Central Missouri and Art Editor of Pleiades Magazine. She currently lives in central Missouri with her husband, the writer Phong Nguyen, and their three sons.